The other week I was coming back from my last run around the lake, (Baby Brown has had enough up and down movement for this pregnancy), when I noticed a tentative mail carrier leaving our home. This was an unusually early time to receive mail although I was more curious why this woman was walking away with such caution. As she drove off I noticed an odd figure hanging from our mailbox. I started to laugh out loud. Hard. 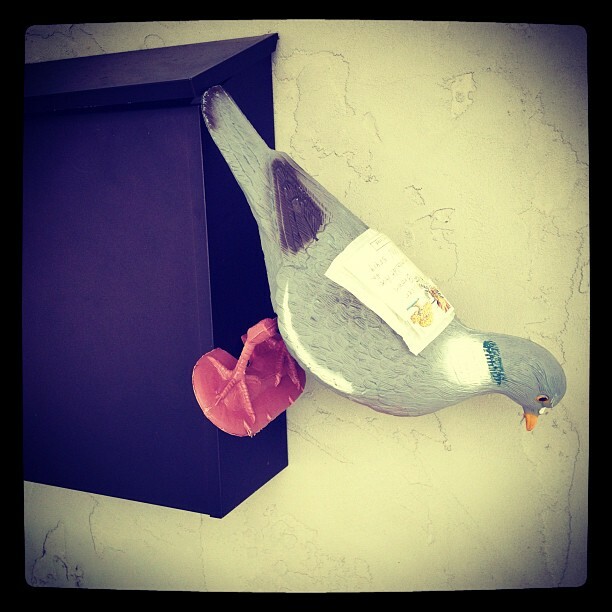 Our Pigeon Post had arrived! Recently Sally, my mother-in-law, had mentioned something out of the ordinary would be arriving via mail. She hinted what this might be only to me. 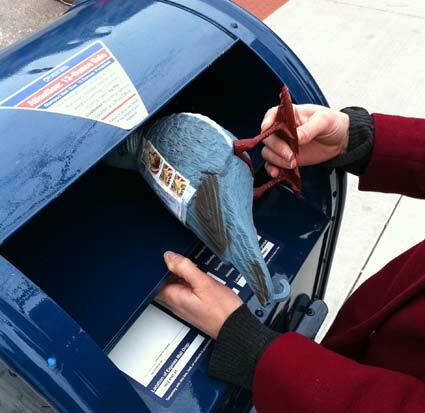 The pigeon was originally sent from cousins in San Marino, CA who had read my holiday gift post and loved the idea of the Pigeon Post from Letter Writers Alliance. I never thought we’d be fortunate enough to receive the carrier pigeon ourselves. So I left the goofy looking bird hanging from the mailbox for the boys to see that afternoon. Their mouths dropped when they returned home from school. After reading the letter sent from Sally & Bobbi, we learned that “Pat the Pigeon” was originally Guru Govind Singh the 118th in retirement from the India Post service. He was one of the best service pigeons, being clocked at a top speed of 125km per hour. Sounds as though Guru is a mentor to the other pigeons serving the LWA in its regular delivery service. Who knew? The boys were hooked. The idea that at one time letters were delivered by pigeons had tackled their imaginations. Who should we send the pigeon to next was a burning question soon on their minds. 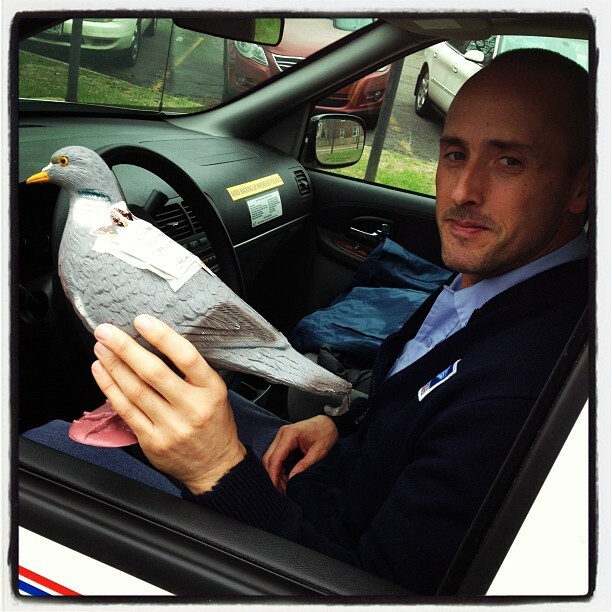 A few weeks later Oliver and I handed Pat the Pigeon to a kind mailman sitting in his delivery van (LWA suggests dropping it in the mailbox but we thought the letter carrier might get a kick out of the bird). He had witnessed a coconut being sent through the mail but a pigeon was the first. So watch your mailboxes, readers. Pat could be arriving at your door any minute now. I have this thing for Don Draper. And you know my feelings on journaling. 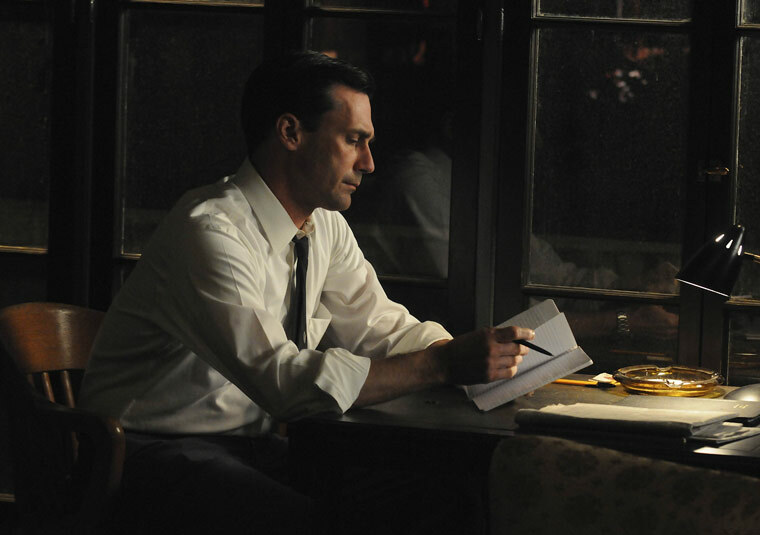 Don Draper + Journaling = Makes my head spin. Tonight. 8pm Central. AMC. Mad Men Season 5 Premiere. OMG. Spring arrived a bit early this year in Minnesota. Not many were complaining other than a few snow lovers related to me. 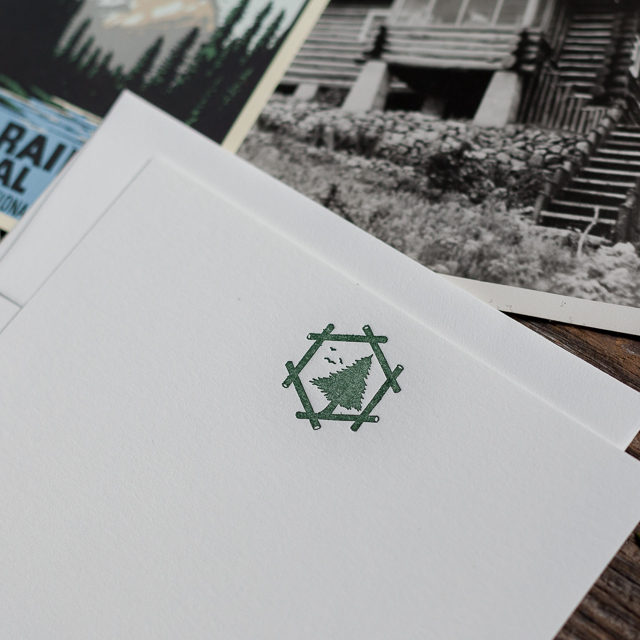 And with every new season, traditions follow along. 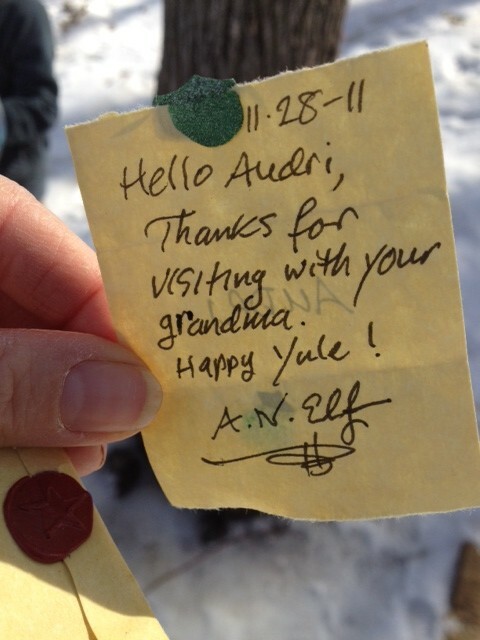 One of them being the first spring walk around the southern half of Lake Harriet to visit the Elf House. 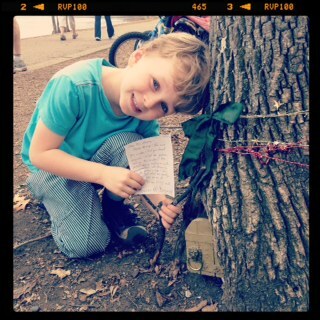 For as long as I can recall, the Elf, who we refer to as Mr. Little Guy, has lived in this tree and responds to every single letter he receives, sometimes more than 1,500 in a year. The enchanting story has caught the attention of people young and old, yet his identity remains a mystery. Impressively, Mr. Little Guy does not write generic letters but personalizes each one with responses to specific questions and details from the lives of his correspondents. In past years his reply letters have usually been typed so we were surprised to find a stash of handwritten notes on our first visit a few weeks ago. Not only were they hand written but were sealed with a wax stamp. Mr. Little Guy had stepped it up. 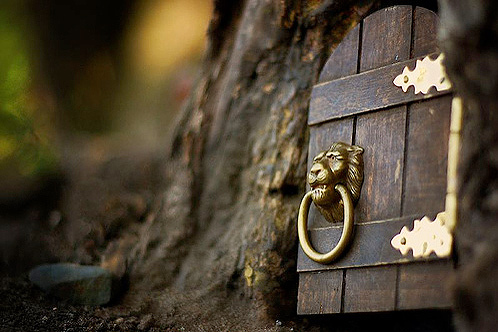 Of course the next trip to the Elf House was soon in the making now that we knew our friend was back from hibernation. In our first letter to Mr. Little Guy, Emmett was curious where he lived over the winter and Oliver needed to make sure the Elf was aware of how many mugs of hot cocoa & marshmallows he consumed during the cooler months. For the boys, I think it’s mostly the mysterious life of this secret creature that keeps them coming back for more. For me, it’s the fact that this anonymous individual has created a free system in the middle of the city for anyone to correspond. 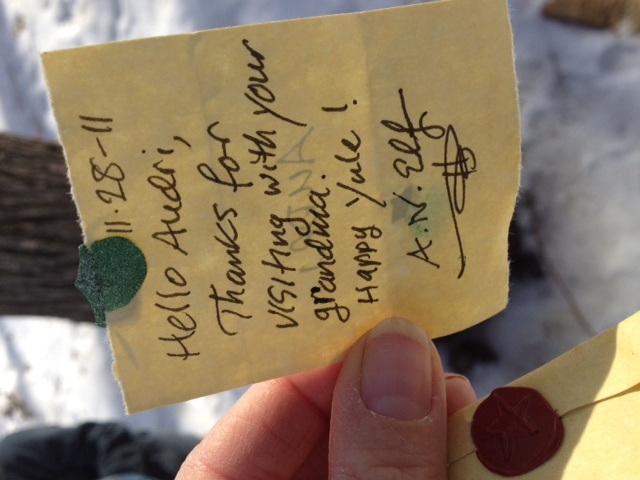 Not only have they taken the time and interest to keep a tradition continuing, but they are encouraging people to write. It’s like their own pen pal that leads another magical life. I want to be the Elf. Maybe before our next visit I’ll write my own letter and ask him if he ever needs help. Or maybe I’ll just stay a kid and believe in the magic of the unknown writer. Walking to the church parking lot last Sunday following a cooking demo I gave – not a sentence I can ever recall writing nor ever expected to write – a friend asked what was the topic for my next blog post. I told her I hadn’t yet been struck with any particular inspiration and she suggested maybe I should write about my job. Now, I’ve been sleeping with the same pillow for years, and I rather like my pillow, but while it’s important to me I don’t consider it particularly rich material for a blog post. I think of my job in the same way. I told her I’d sleep on it. I’ve been in my current job, or at least have been in the same line of work, for about 12.5 years. Mostly what I do is analyze companies, situations, or events and take that knowledge and use it as a tool to (hopefully) benefit investors in my company. Some days are better than others but every single day involves talking on the phone or meeting with people in person, and, for me at least, that involves taking notes. Much notes. 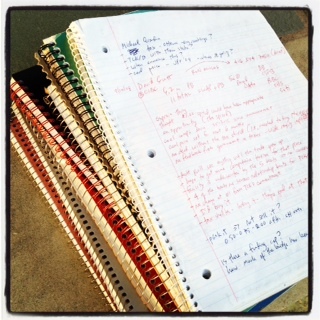 Stacks of notebooks kind of notes. And these notes are the kind taken by hand with a pen and paper. I make that last distinction purposefully. I was in a meeting on Wednesday in Miami with management of a larger biotech company. Alongside me were two other analysts (folks who generally do what I do) from a snazzy firms in my industry. While discussing the likelihood that the company’s cancer drug will get FDA approval this year I madly scribbled notes in my notebook. And when I say notebook I’m talking about the kind that has paper and lines and a big wire screw-lik thing holding the pages together. My fellow analysts were madly – thous less so than me – tapping away at their iPads. I suppose I can sort of see the benefit in having notes in electronic form, (they can be shared and they are legible for instance), but for me the act of committing thoughts and words to paper is a necessary step in ensuring information reaches and remains somewhat lodged in my brain. Perhaps part of my note taking fealty is a function of my complete lack of typing skills, (typing was offered at my high school and my golf coach was the typing teacher and we didn’t have a great golf team and word was he was a better golf coach than typing instructor, so…), but that’s only a small part of it. I believe that comprehension increases via old fashioned note taking as compared to iPadding and it will be a cold day in South Beach before I ever make a change. 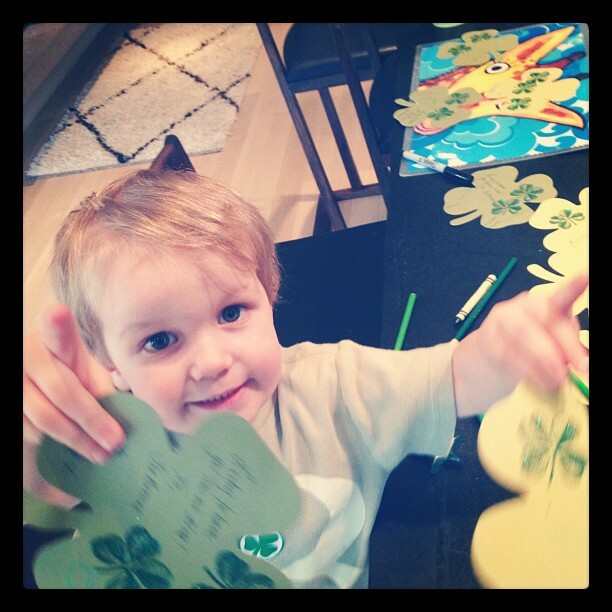 Thursday afternoon turned into a glitter fest while making shamrock cards with my little Leprechaun beside me. After Oliver stopped using the green glitter as finger paint and attempting to tryout the heat gun on his hair, we both took a deep breath and found a good rhythm to our card making madness. As an old Irish proverb once said, a light heart lives longer. Enjoy the green beer and a lighter heart today.